The Snipping Tool is included in Vista and Windows 7 and it allows you to take quick and easy screenshots on your pc. It’s much nicer then having to do the print screen, open paint, and paste trick, but there’s one downside. 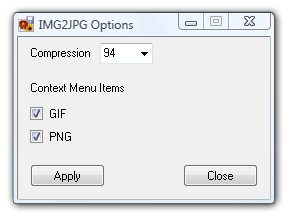 You can’t change the quality settings to allow for higher quality JPEG or PNG files. The PNG files come out looking great, but the JPG files are saving at something like 50 percent quality. They look like garbage. Some online services aren’t set up to accept PNG yet so If you need a high quality JPG file the Snipping Tool is pretty much useless, until now. I found a program called IMG2JPG on WindowsForums.org, and it’s made by a guy called Disk4Mat. It basically adds a shell extension, when you right click a PNG file, to change convert the PNG to a JPG, and you can set the quality setting to whatever you want. It a run once program that doesn’t run as a background service and eat up resources. Just make sure that after you install it, run the Options setup as an Administrator, so the options save properly. So now you can use your Snipping Tool to take a nice high quality PNG file and then later on convert it to a JPG.